Every mobile app needs to be analyzed and tracked for its growth and proper monetization. This is where mobile app analytics tools come in. Through the use of various metrics, these mobile app analysis tools provide knowledge to marketers that can be leveraged to increase user retention. It ultimately leads to more revenue generation. In this article you will learn about the best mobile application analytics tools, how they work, their features, metrics, pricing, case studies, and many other things. Click here to see the image in full size. Mixpanel mobile analytics is an advanced mobile app tracking tool that serves nearly 3000 clients including Airbnb, WordPress, Miniclip, and Match.com to name a few. It has tons of analytical tools that are available for virtually every type of data collection and analysis. 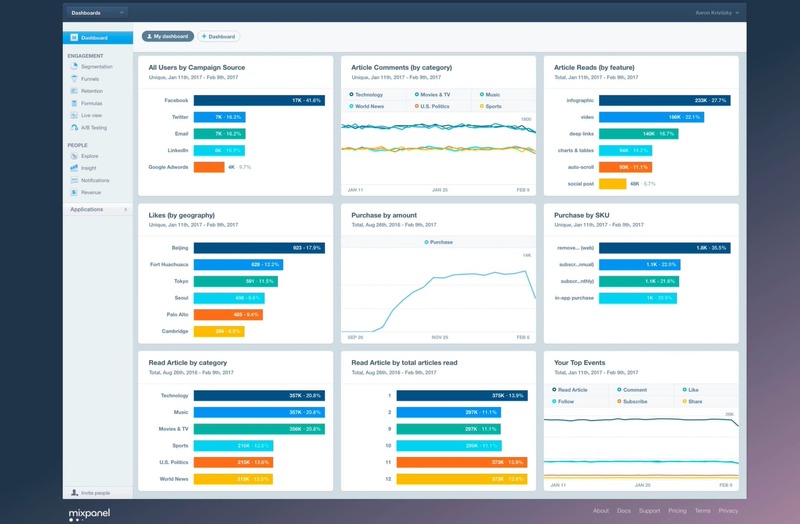 Mixpanel is a freemium tool with around 25,000 data points per month. Each data point is counted every time an event is tracked. Event-based tracking: Tracking of users’ interactions with the content on the app. Marketing Automation: Send a notification, in-app message, email or text message. JQL Tool: Analyze raw data of customer on Mixpanel by adding JQL queries to the app. Funnels Creation: Easily create funnels and measure how customers move through a series of events. Easy to use user interface: Very user-friendly dashboard. Allows an in-depth analysis: Drill into data with instant insights and find out what’s happening. Cross Platform: Connect a mobile to the web or vice versa. Activity Feed: Allows to see the timeline of every action that a user takes. Reports: Very insightful user engagement reports. A/B testing: Experiment with different ideas about your app and see which one works best. Easily track users through funnels. Segment users based on factors like their behavior and geographic. Create profiles for each user to quickly see what they did with the app. Restriction of time frame on visualizing the data into funnels. Cohort Analysis: Mixpanel leverages cohort analysis to precisely see how often the users are coming back and engaging with your application. Queries: It can build complex queries from demographics and events. Retention Rate: Mixpanel measures how many users you have retained over a period like a month, quarter or year. Profiles: Helps you learn who your users are, what they have done with the app and allows you to connect with them. It’s pricing ranges from the free plan to $999 per month. 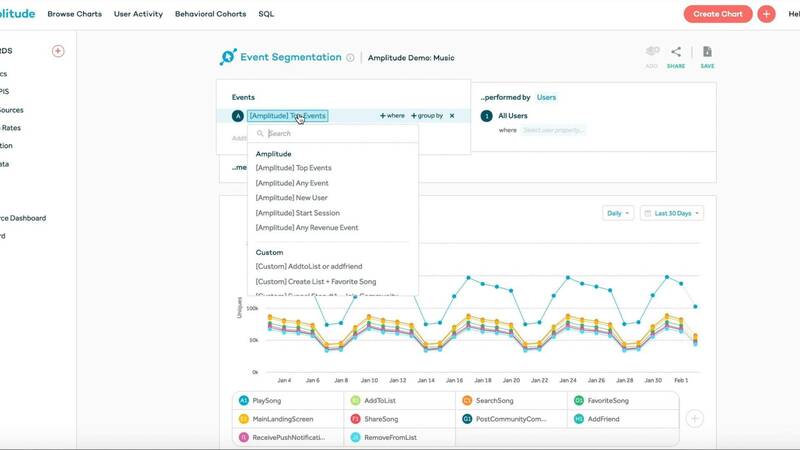 Amplitude is of the best web and mobile app analytics tools that aim to provide access to “behavioral layer” of user data that exists as an intermediate level between the raw data and the dashboards. It reveals which actions are most commonly taken after a user signs up and which actions resulted in purchases. This ultimately helps teams focus on the features that derived purchase actions. Reporting in real-time: Very insightful user engagement reports. API access: Increased security with access authorization to your team only. Data export: Export event data for a given project that was uploaded within a particular range of dates. Permissions for teams: Invite your team members and grant them specific permissions. Custom dashboards: Create dashboards that are easiest for you to work with. Behavioral cohorts: create a custom definition of a users’ group based on the events they have performed. Graph and data annotations: Program important notes on your data charts. Revenue analysis: View all relevant revenue metrics for the performance of your project. Retention Rate: Measure how many users you have retained over a period like a month, quarter or year. North Star Metric: Capture the core value your product is delivering to your customers and help your team focus on a unified strategy to increase the value. Stickiness: Measure how many users are likely to return to your app. It will help you increase customer loyalty. Conversion: Track conversion rate and improve it to drive more revenue to your organization. Free starter plan, $995/month for a business plan and the enterprise plan is available upon request. Bubbles: New users can benefit from help bubbles containing tips. Apps Overview: Provides an overview of all added apps with a number of users or sessions. Apps comparisons: Compare apps in a criteria such as sessions, users, new/returning and so on. Query Building: Build your queries and get a CSV file. Unlimited app addition: Add unlimited apps even in the free version. Easy Marketing: Send in-app messages with advanced segmentation. Users: Shows an average number of users on a daily/monthly basis. Session Length: How active the app user is in each session from opening to closing of the app. Time in App: How much time the user is spending in the app over a period of time. Acquisitions: Number of users who downloaded the app through a specific source. Screen Flow: Path of a user through your app. Retention: Number of users returning to your app after the first visit. Life Time Value: The amount of revenue you expect to receive from a user throughout their usage of the app. Android, iOS, Windows Mobile, HTML5, and Blackberry. Adjust is a mobile app tracking tool that enables mobile app marketers to examine the store statistics, advertising sources along with different advanced analytics to be able to monetize their apps fully. It comes with tons of mobile data analytics metrics and features. Event Tracking: Tracking of user’s interactions with the content on the app. Cohort Analysis: See how app changes are affecting the same group of users over time. No anonymous IP: Anonymous IP filtering. Data Filtering: Rejection of fake installs and traffic. Tracking: Easily track every marketing channel. Targetting: Serving the right ads to the right audience. Audience builder: Create customized user lists. Adjust the dashboard: Customize the dashboard to your preference. Tons of in-app analytics: Several useful in-app analytics helping you get more insights. GDPR Forgets: The total number of users who asked for being forgotten by using their right according to GDPR. Session Length: How actively the app user is in each session from opening to closing of the app. Impression Conversion: Percentage of users who had an ad impression and installed the app within 24 hours. Clicks: Provides a total number of clicks in a specific period, the percentage of users who clicked the ad and got converted and click to impressions ratio. Installs: Number of users who installed, uninstalled, and reinstalled the app along with reattribution reinstall. Revenue: Total revenue generated, total revenue that events triggered, and revenue per event. Available by contacting the sales team of Adjust. It also has a free demo version. Windows, Linux, Android, iOS, Mac and Web-based. 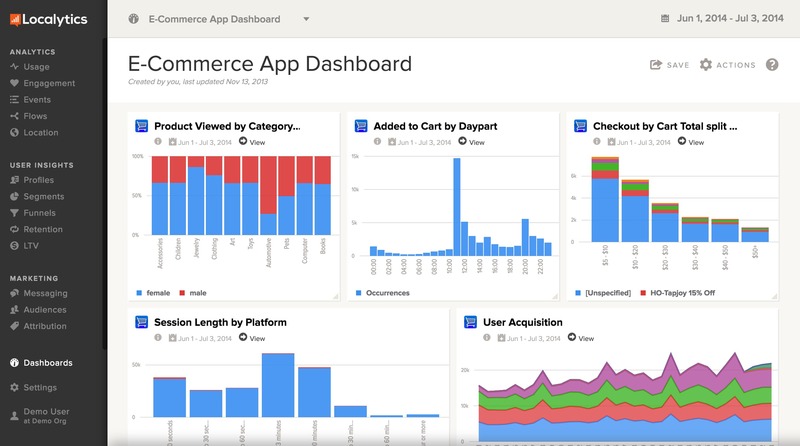 Unequivocally one of the best mobile application analytics tools, Countly provides businesses with a powerful platform for web, game, and mobile app analysis. It gathers data related to customers and displays all the information on its user-friendly dashboard. 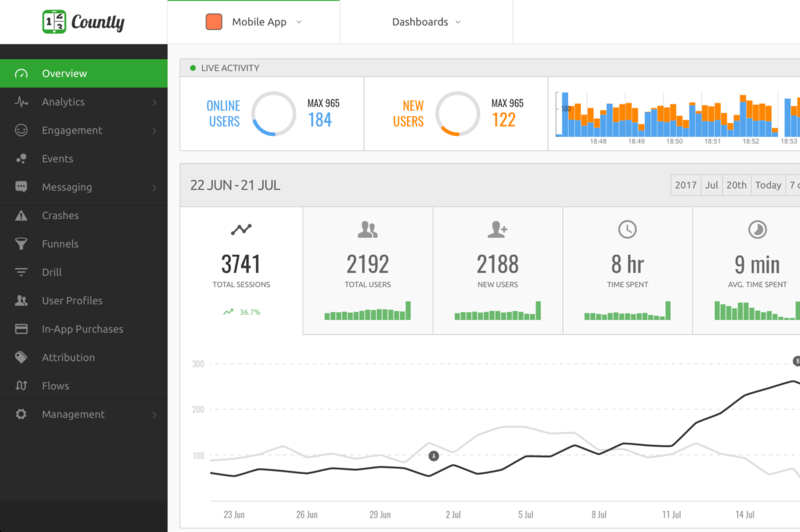 Besides being one of the premium mobile app analytics tools, Countly is also open-source meaning it can be used for free (with limited features) if hosted by the user. User Interface: Excellent and easy to use user interface. Appealing design: Very sleek design that makes your team want to work more. Works in real-time: No lags, direct insertion of data into the database as soon as it arrives. Open Source: You can host it on your own server. Cloud version: Powerful and secure database (coming soon). User-friendly dashboards: Very easy to use without complexities. User segmentation: Go deep down into granular data without having to write any database queries. Even tracking: Tracking of user interactions with the content on the app. Track funnels: Track how customers move through a series of events. Users: Get an average number of users on a daily/weekly/monthly basis. Countries: Gathers and shows the demographic data of users. Devices: Provides information of the devices that users are running along with the app versions. Carriers: Provides data about the carriers and platforms that user are using as well. They have a free version that can be hosted by the user and the enterprise version that you can get the quotes for upon demand. We hope this mobile app analytics tools comparison has helped you get good knowledge about some of the best mobile app tracking tools. Different marketers have different needs, and one mobile app analysis tool cannot satisfy every need.